There’s a new nifty 50 in town. 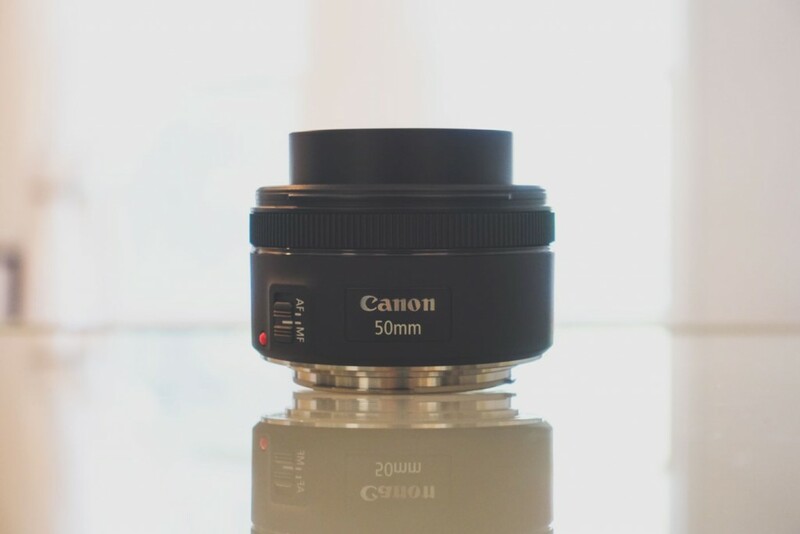 In this short review we test out the Canon EF 50mm f/1.8 STM, Canon’s latest iteration of their affordable 50mm lens. At about $125, it’s the cheapest Canon prime lens available, making it an attractive addition to any Canon kit. Let’s see how it does with astrophotography. The Canon EF 50mm f/1.8 STM is Canon’s newest most affordable prime lens. At 50mm, it’s considered a “standard” lens: not wide and not narrow, providing a relatively natural 46 degree field of view when used on a full frame camera. It features a fast f/1.8 aperture which makes it attractive for shooting in low-light conditions. 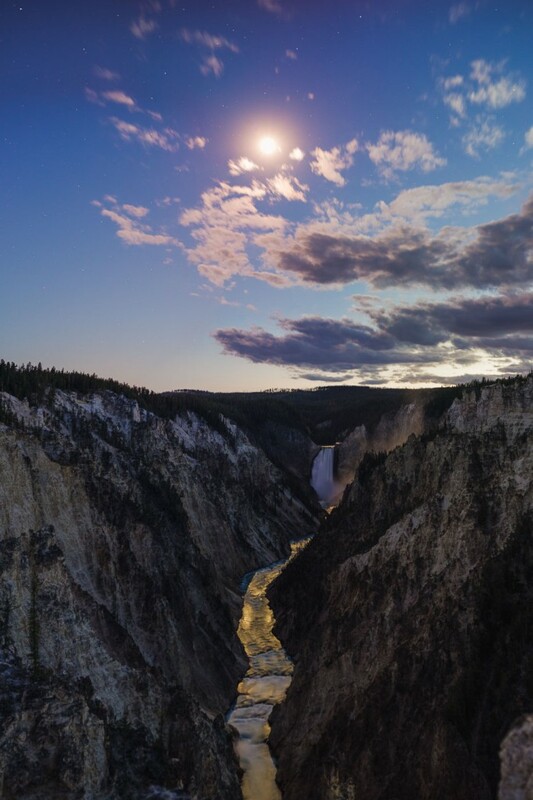 We tested the lens for a couple of weeks, shooting on a few clear-ish nights in Yellowstone National Park in Wyoming and Waterton Lakes National Park in Alberta, Canada. 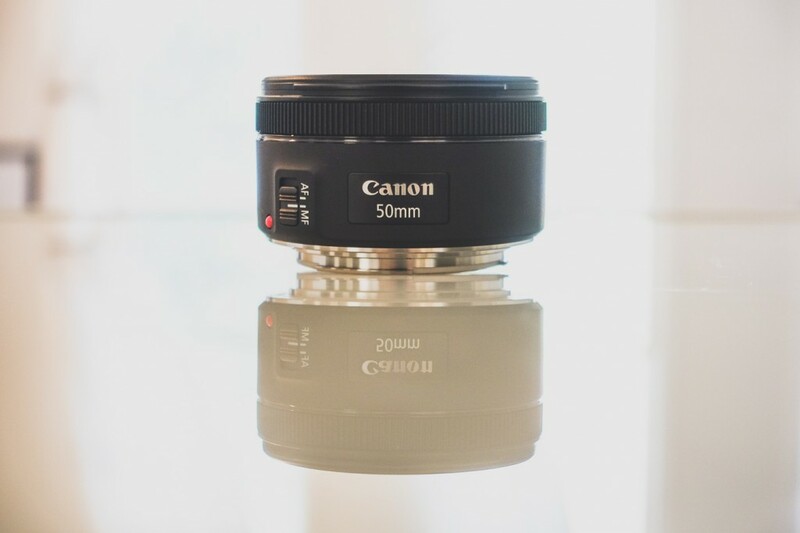 The Canon EF 50mm f/1.8 STM lens is also the first lens we tested using our newly developed aberration test method. Let’s review some quick specs and see how the lens performed. 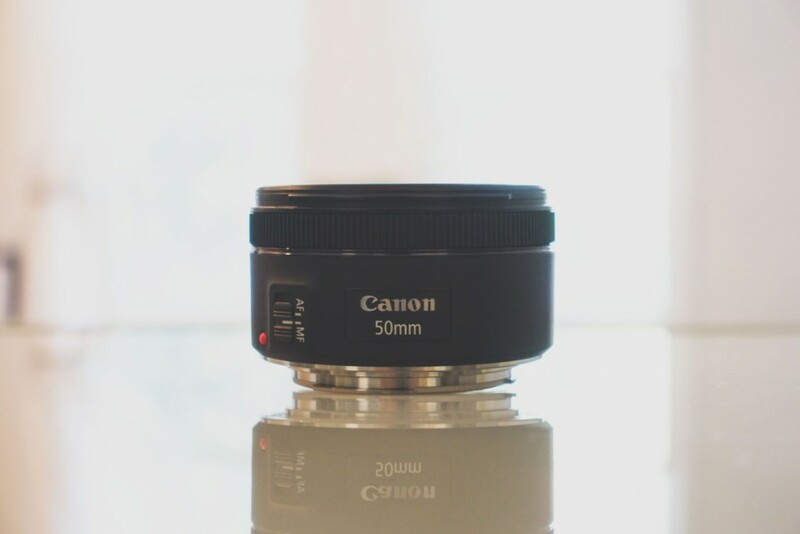 The Canon EF 50mm f/1.8 STM is compatible with all Canon EOS DSLRs with the EF and EF-S mount. It’s a very small and lightweight lens, making for a comfortable walk around kit with a standard field of view. I really like the 50mm focal length for “everyday” photography. It’s narrow enough to force you to compose but wide enough to still use it practically for capturing a scene. It’s a focal length that requires a little more care to use effectively, and I think that’s the reason that a 50mm is so often recommended as a must-have lens for any serious photographer’s kit. This latest iteration of the lens is much improved in mechanical quality over its predecessor, the EF 50mm f/1.8 II. The new EF 50mm f/1.8 STM features a metallic mount, much preferable over the older plastic mount. The lens barrel is all plastic which keeps the lens very lightweight but still gives it a high quality feel. The optical design seems very similar with 6 elements in 5 groups. There is no mention of the use of any aspherical elements, so this seems to be a re-hash of their older design. The lens does feature an updated aperture diaphragm with 7 curved blades that should keep out of focus highlights (bokeh) looking round at intermediate apertures (which is more desirable than the pentagon-shaped bokeh that the old lens produces). The 7-bladed aperture will produce 14-pointed star bursts on point light sources when stopped down to a high f/number. The lens uses Canon’s new STM stepper motor focusing system which is much quieter and faster than the old gear drive focusing system (but still not quite as silent as Canon’s USM ultrasonic motor focusing). The lens features a simple AF/MF switch to flip between autofocus and manual focus modes. The lens is focus-by-wire but feels very fast and linear, making manual focusing very easy and autofocus very quick. The lens does not feature internal focusing and instead uses a dated rack focus that moves all of the lens elements forward and backward when focusing. This is a barebones, budget friendly 50mm. The lens does not feature any kind of distance scale to indicate focus position. It features a 49mm filter thread and a bayonet for the accessory ES-68 lens hood. This is a barebones, budget friendly 50mm. 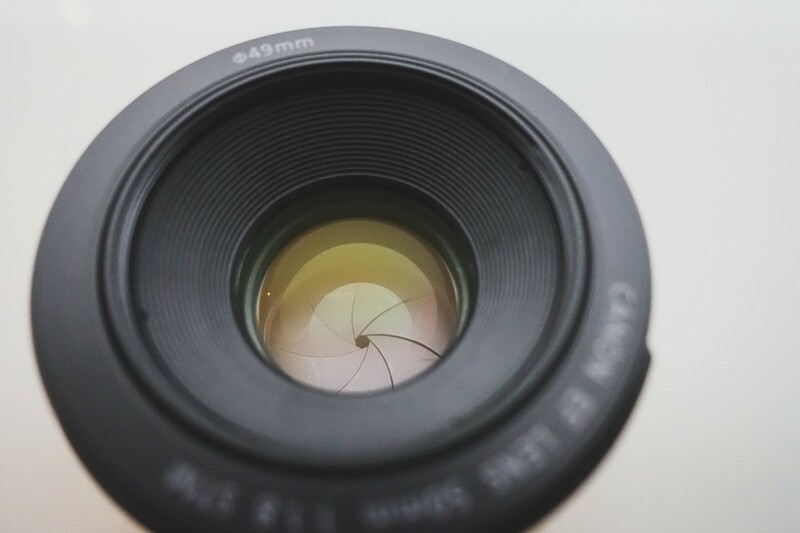 Other than the stepper motor focusing and the increase in aperture blades, there’s nothing particularly new or revolutionary about the 50mm STM. It’s a simple photographic tool that fits its affordable price point. As Canon’s cheapest prime lens, the EF 50mm f/1.8 STM is not Canon’s sharpest lens. 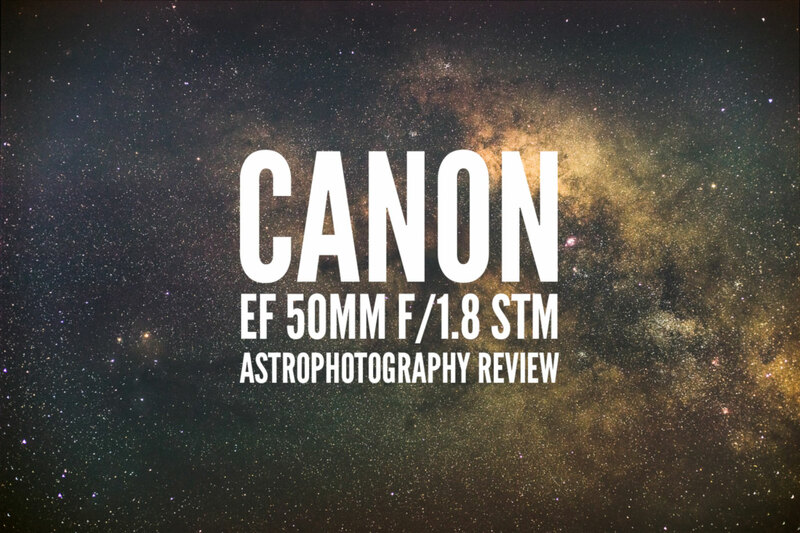 We expected this going into the review but still wanted to see what could be done using such a cheap lens, especially in the context of astrophotography. For most general daytime shooting, I would recommend this lens in a heartbeat. For the price, it’s a wonderful portrait shooter and is capable of very sharp photos from about f/2.8 and higher. The attractive thing about the 50mm f/1.8 STM is its ability to shoot wide open at f/1.8. The very low f/number allows the lens to capture more light in dark situations for cleaner final images than if a higher f/number was used. Low f/numbers also allow for narrower depth of field, an attractive trait of most portrait lenses. Therefore, the 50mm f/1.8 STM works excellently for portraits. Most fast aperture lenses compromise some sharpness in order to achieve low f/numbers, and the Canon 50mm f/1.8 is, unfortunately, no exception. At f/1.8, the lens shows considerable aberration and slightly reduced contrast. The corners are not particularly sharp at f/1.8. For astrophotography, I would not recommend using the Canon 50mm f/1.8 STM at its wide open setting of f/1.8, as it greatly distorts stars at this setting, especially in the corners of the full frame. Upon stopping down one and a third stops to f/2.8, the lens sharpness increases considerably across the frame and the performance for star photography is much improved. I think f/2.8 is the 50mm STM’s sweet spot where it has the best balance of light gathering and sharpness. The aberrations in the extreme corners of the full frame image never really go away at f/2.8, but these imperfections are small enough to not be distracting. Normally I’d say it’s disappointing that the lens produces so much aberration wide open, but at such a low price it’s hard to complain too much. 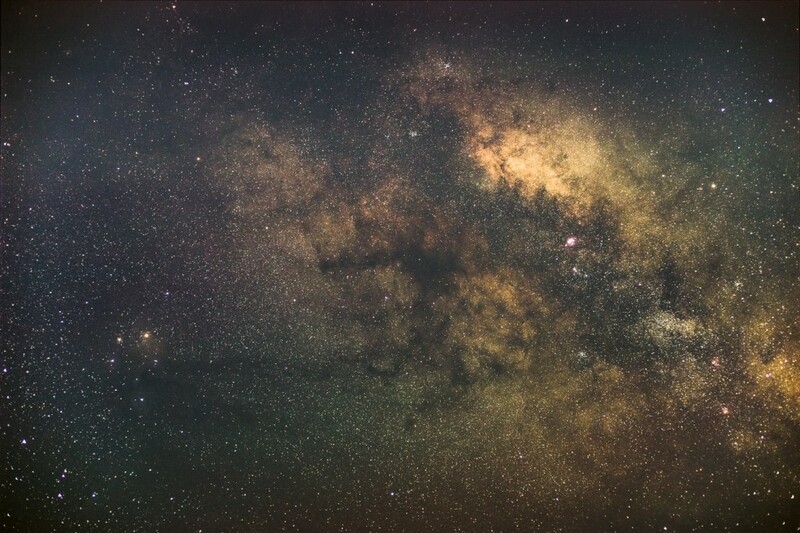 The 50mm focal length is a little narrow for capturing the Milky Way, so the lens’s best use is for capturing narrower crops of detailed sections of the sky, perhaps using multiple frames for producing a stacked image or even a panorama stitch for a wide angle field of view. 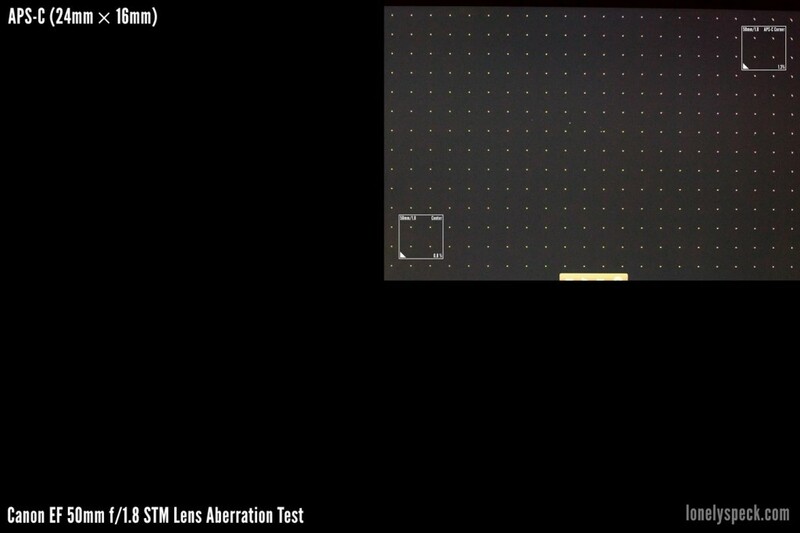 In order to fully characterize the aberration performance of the Canon 50mm f/1.8 STM, we performed a simple test that I developed that shows the shape of the aberration at several f/number stops. This shows how the lens improves as it is stopped down. 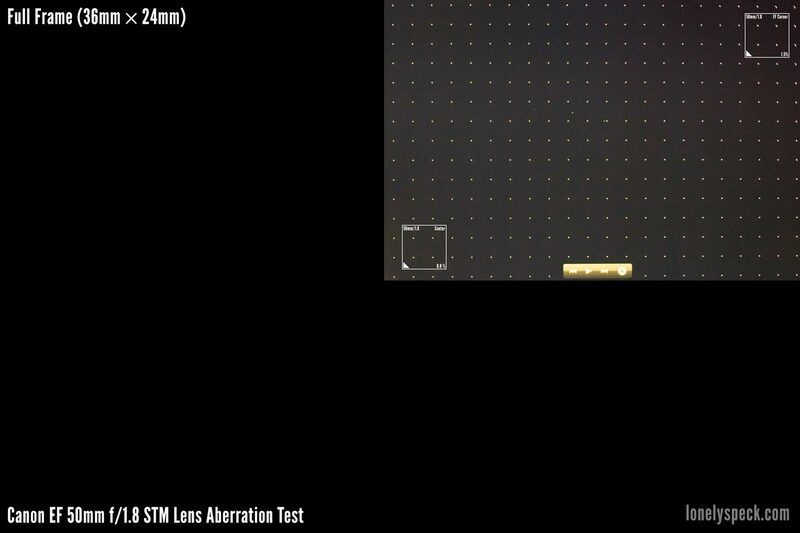 The test is performed on both full frame and APS-C frames. 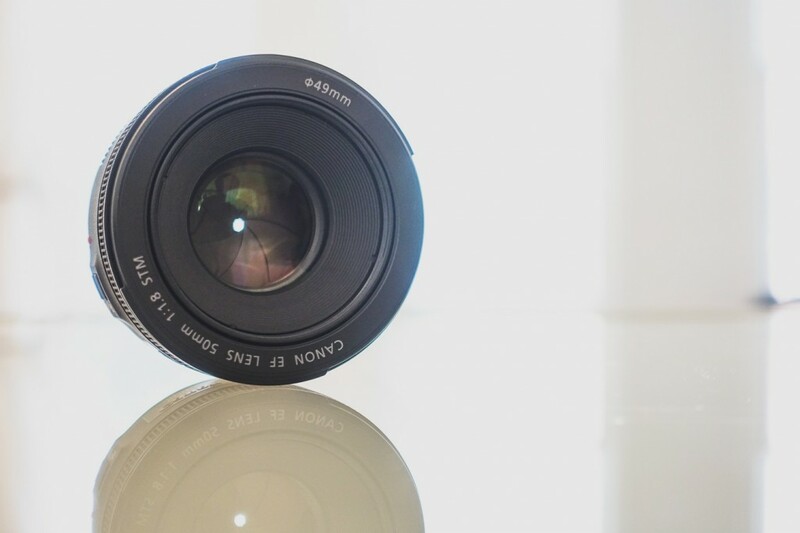 We tested the 50mm STM at f/1.8, f/2 and f/2.8. If you would like to read more about lens aberrations and see a more detailed explanation of our test, check out our Practical Guide to Lens Aberrations. At f/1.8, the Canon 50mm f/1.8 STM shows noticeable coma at the edges of the APS-C frame, and the aberration transitions into a mix of strong sagittal astigmatism and coma by the corner of the full frame. Stopping down to f/2 doesn’t show a huge improvement but the size of the aberrations is slightly reduced at this setting. It’s only upon stopping down to about f/2.8 that the size of the aberration starts to reach very good levels of about 0.5% of the frame height. We got our Canon EF 50mm f/1.8 STM from B&H as a loaner for this review. 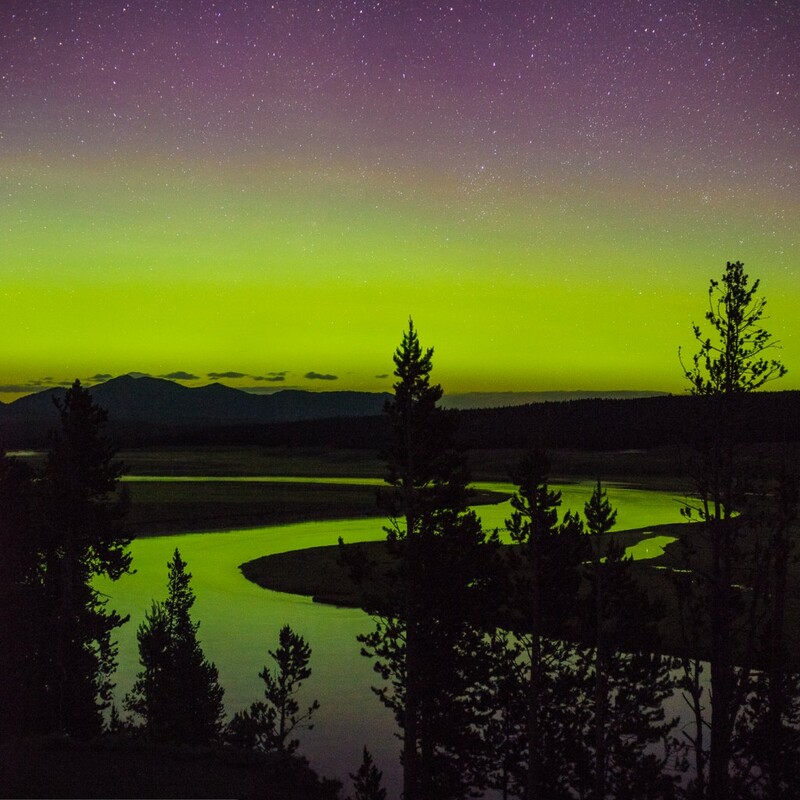 The lens followed us on our road trip across the central western region of the United States and Canada. 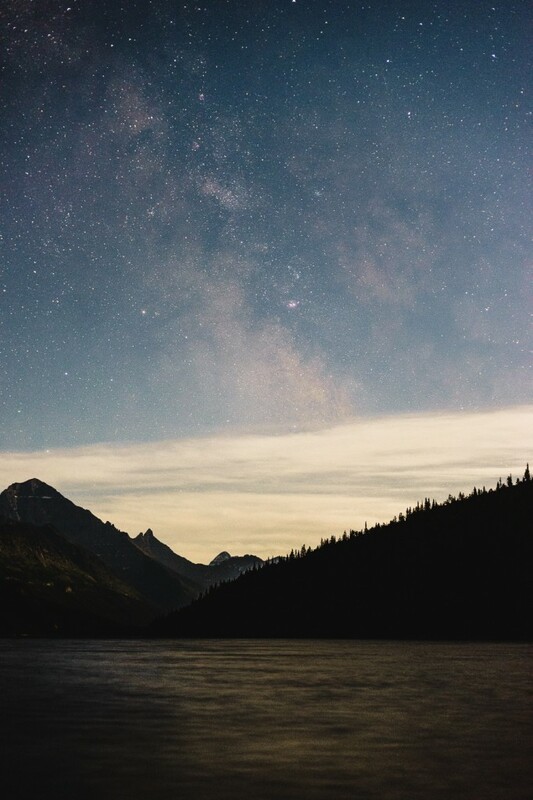 I had the opportunity to use the lens for astrophotography while camping in Yellowstone National Park and Waterton Lakes National Park. 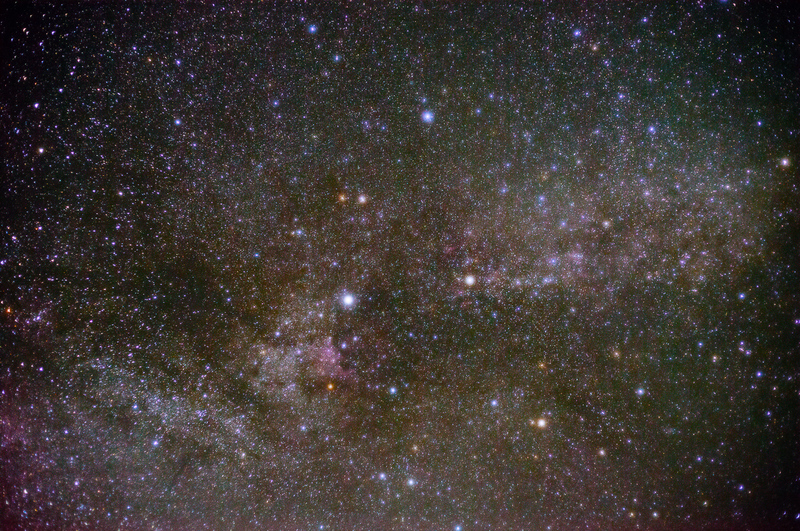 You can see the bright star Deneb just left of the center of the frame, and just below it is the pinkish-colored North American Nebula. Overall, I felt pretty happy with the performance of the lens stopped down to f/2.8. My next opportunity to shoot was several days later, and this time I had a clearer view of the galactic center, albeit with some light pollution from a partially lit moon. At dusk, we stopped by Yellowstone Falls, and I made a quick panorama stitch to capture the Grand Canyon of the Yellowstone with the moon directly over the falls. As the moon approached the horizon and the sky grew darker, I wanted to see how well I could pick up the fine details and dust lanes visible around the galactic center. I shot a sequence of about 24 photos and stacked them for noise reduction. There was still an ample amount of light pollution from the moon in addition to (what I didn’t know at the time) the aurora borealis, so this image required some color correction to compensate for the bluish purple hue of the image straight out of the camera. Stopped down to f/3.2, the lens did a great job at capturing the fine details of the galactic center, and most of the stars look like nice pinpoints. 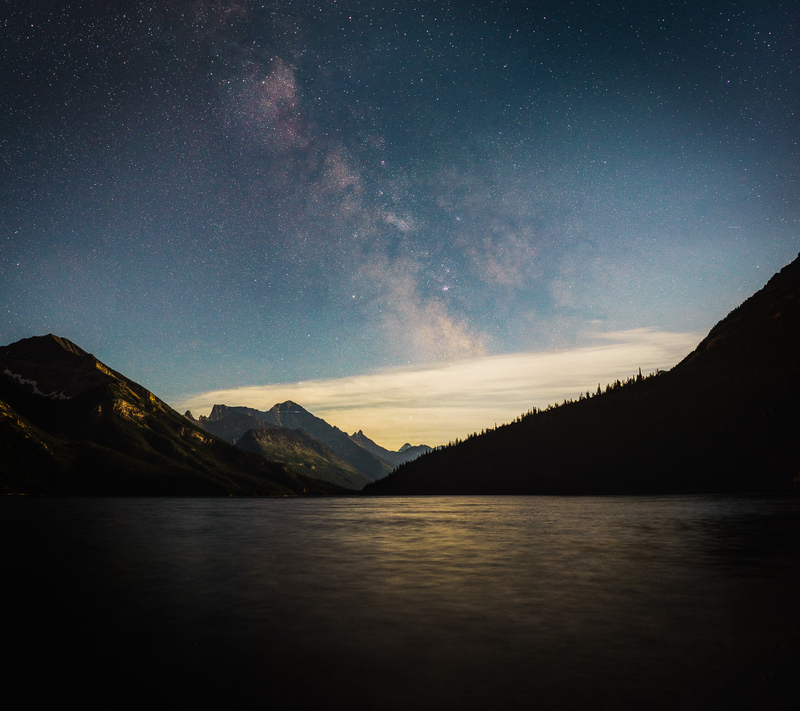 Later in the week, we traveled north to Waterton Lakes National Park in Alberta, Canada. The moon was in its late phase, so I had to wait until after midnight for it to start setting in order to capture the galactic center. 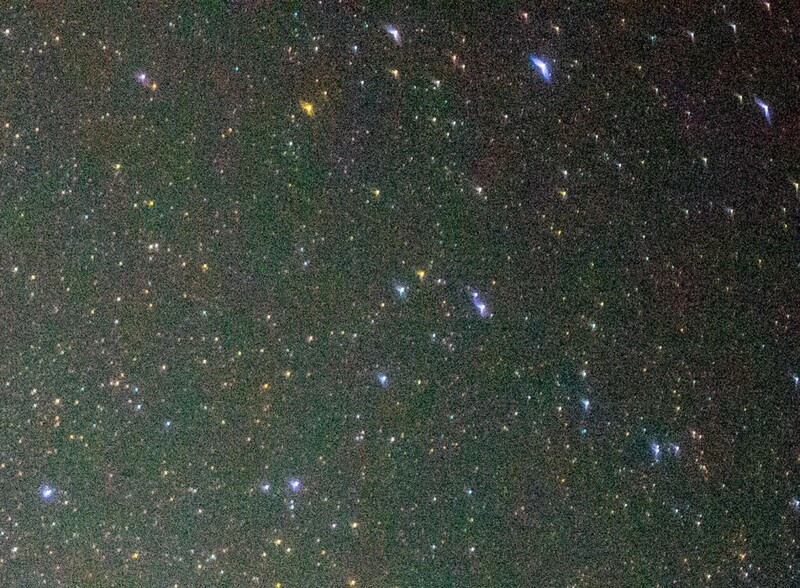 Below is a great example of the narrow view that a 50mm lens provides of the night sky. 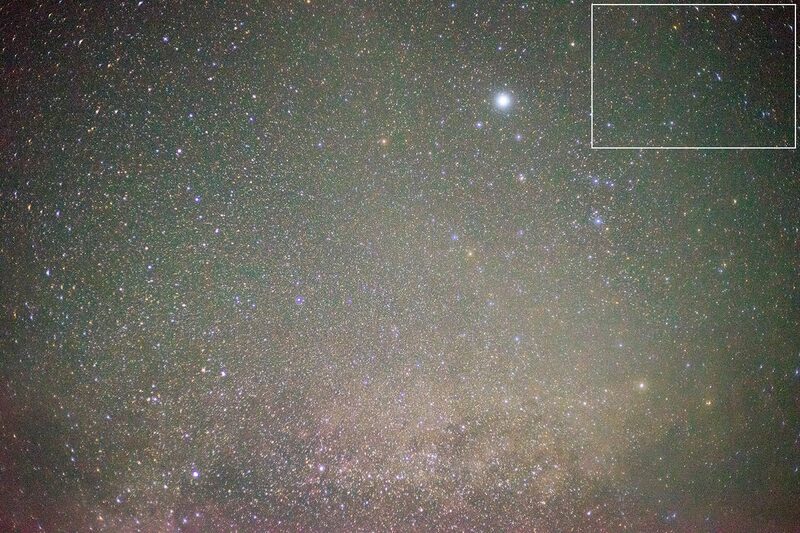 It’s possible to just fit the galactic center in the frame, but compared to my typical landscape astrophotos, it still looks rather cropped in appearance. Using the 50mm to shoot a wide angle stitched panorama is one of my favorite techniques for capturing the Milky Way, and the 50mm f/1.8 STM proved to be a great lens for doing just that. 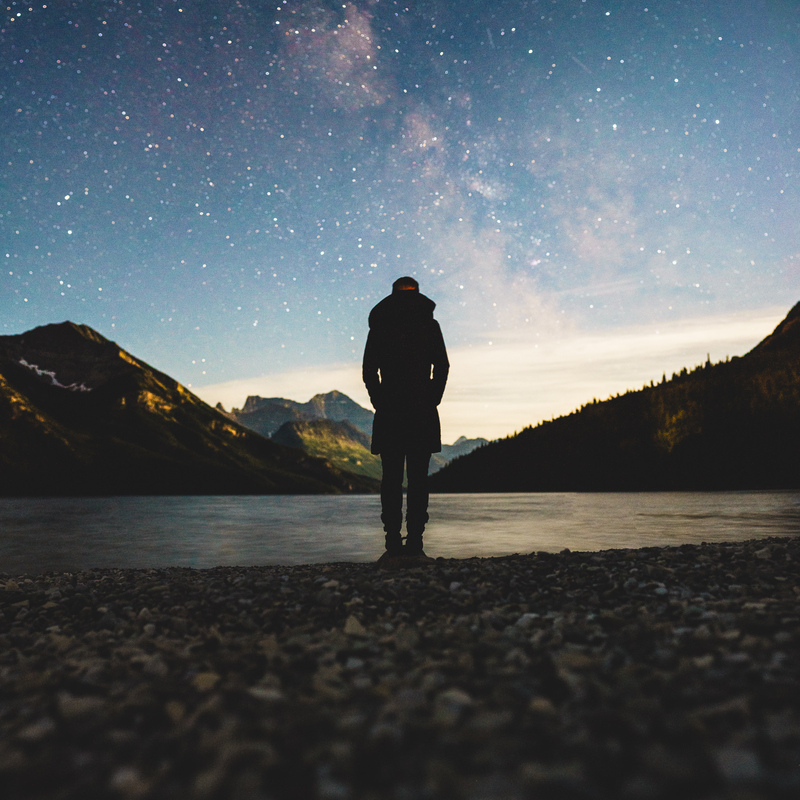 For the final photograph of the night at Waterton Lakes, I pulled my focus onto Diana as she stared out at the serene scene for a final panorama stitch. The Canon 50mm f/1.8 STM isn’t a spectacular performing f/1.8 lens, but it is very good at f/2.8 and higher f/numbers. For such a cheap price, it’s a very useful and affordable astrophotography tool, particularly for panorama stitching. I would expect substantially better performance from other 50mm-ish lenses like the Sigma 50mm f/1.4 Art or the Sony Zeiss 55mm f/1.8, but these lenses are substantially more expensive than the small Canon 50mm f/1.8 STM. Compared to the older Canon 50mm f/1.8 II, it seems almost identical optically but offers improved build, autofocus and a better aperture diaphragm while still being offered at nearly the same price. I expect this lens to be one of Canon’s best selling lenses for a long time. There’s nothing else in the 50mm range that’s available this cheap Canon’s current lineup, so it’s a great option if you’re on a budget. It’s not perfect optically but stop it down to f/2.8 and it still manages to perform well while providing ample light gathering for night sky shooting. For just over a hundred bucks, I’ll take it. Recommended for beginners on a budget that especially want to try out panorama stitching of the Milky Way. Hey Ian! As a beginner photographer, I’d love to get some practice and experience editing some images. Also, no offence, but I think I’d like to edit a few of these in a different style. 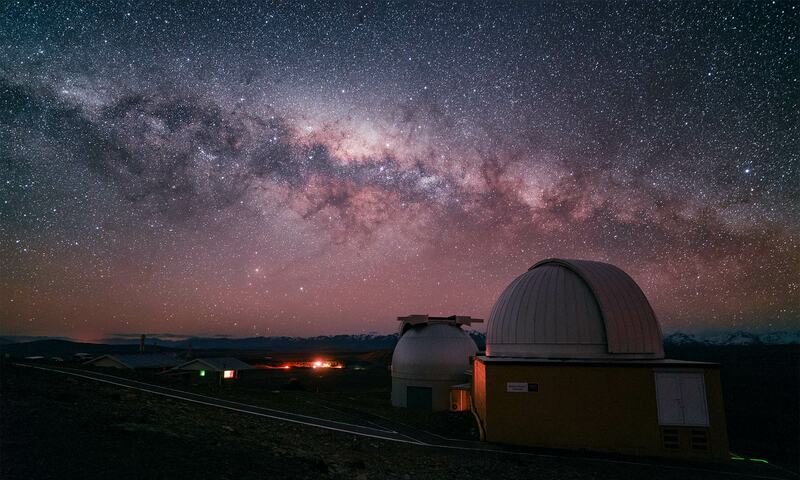 Would you be willing to provide some (maybe slightly cropped to prove your ownership) RAW files of your images, especially the image of just the core of the milky way? You can contact me at my email – anurag(dot)kishore202(at)gmail(dot)com. Thanks in advance! How will this lens perform on aps c sensors? Did you took the images on ff or crop sensors? Hey love the article. I just got this lens and am semi-new to photography. I’m working with a 7D and am wondering what your general camera settings were in the Q menu? Trying to figure out what’s best to manually change for night/star photography. If the 50mm f/1.8 isn’t sharp until f/2.8, I wonder if the similarly affordable 24mm f/2.8 STM “pancake” could be used with similar results?